The Steaksmith Restaurant also located right down the road on the Old Las Vegas Hwy at El Gancho Fitness Center. 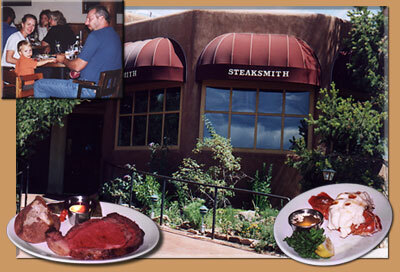 The Steaksmith was originally located in the St Francis Hotel downtown many years ago. When I was a little girl and lived in Texas we used to come to Santa Fe and eat at The Steaksmith and order the Alaskan King Crab. I have very fond memories. It is probably my most favorite comfort food restaurant in Santa Fe. It is always consistant and has very good steaks and seafood. They also have a creative bar menu that you won't get bored with. The service is outstanding. You don't have to pay extra for your salad and baked potato with your entree here. The petite fillet and the wild caught salmon are two of my favorite entrees. I also love the spinach cheese balls with hollandaise sauce and Jeannie shrimp. This is a great family restaurant when you want a nice dinner that is not pretentious. It is moderately priced and much less expensive than the Steakhouses in town such as Rio Chama and The Bullring and just as good.